Reading this Report will make you angry. It reveals how ill fares the right to education today. Globally, it is denied despite pretty United Nations’ rhetoric on human rights mainstreaming and rights-based development. Its denial is epitomized in levying charges even in primary school, thus pricing it out of the reach of the poor. This bitter reality of economic exclusion from education is evidenced in no less than 22 different types of fees in primary school which should legally be free. Children and young people are silent victims of global bureaucracies, whose creative statistics and evasive vocabulary disguise their failure to translate any of the promises made into reality. The law, which mandates education to be free and compulsory, has been cast aside. Education should be free but it is for-fee. People lucky to live in countries where at least compulsory education is free think that this is the case worldwide. People in poor countries are forced to pay up to a third of their annual income to keep a child at school. Worse, children are forced to work, even at school, to pay the cost of their primary education. None of this can be gleaned from official documents. Read the Report. Get angry. Help expose and oppose economic exclusion from education. The State of the Right to Education Worldwide. Free or Fee: 2006 Global Report summarizes in 281 pages the shortcomings of global educational promises and then examines how the right to education fares in 170 countries. Developing and transitioning countries are divided into six geographical regions and 31 tables highlight the key findings derived from country-by-country surveys. 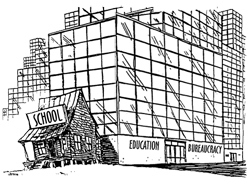 The Report highlights the abyss between the domestic policies of wealthy creditor and donor governments which keep compulsory education free, and their external policies which have made it for-fee.